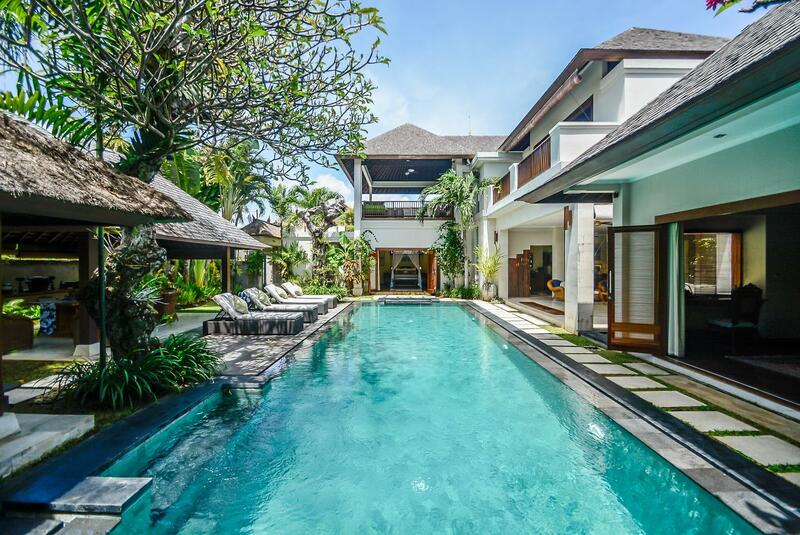 Designed as a holiday home for the owners themselves, this 4-bedroom villa has an amazingly central location in Seminyak, tucked away in a discreet luxurious complex less than 300 metres from the beach. 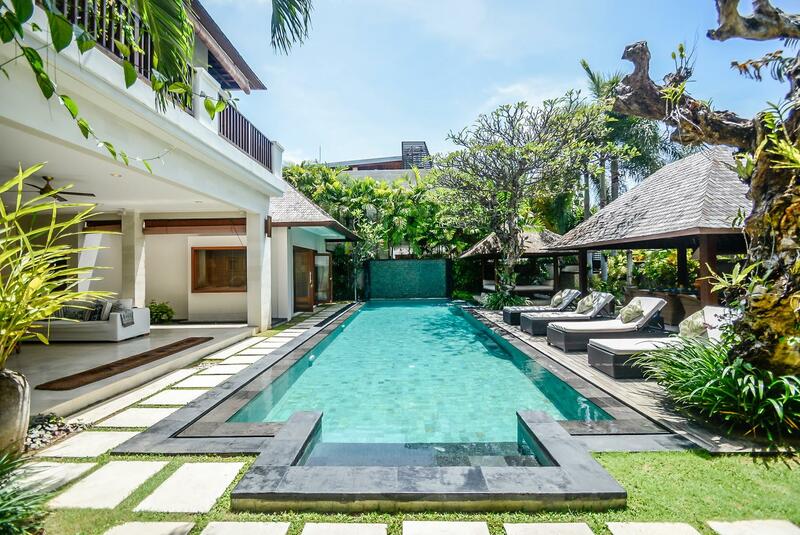 While Seminyak is known for its international restaurants, chic boutiques and glittering nightlife, Villa 3169's location on a dead-end road with no traffic, surrounded by expansive tropical landscaped gardens makes it an oasis of calm in the middle of Seminyak's bustle. 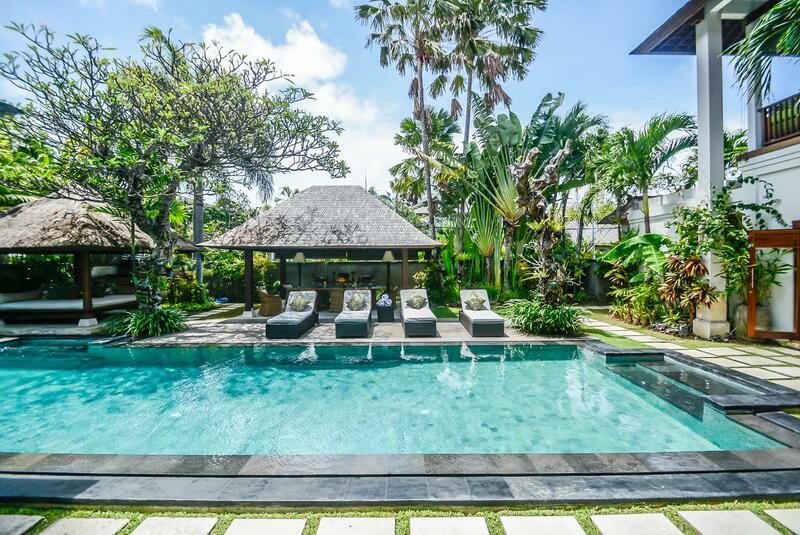 Staying at Villa 3169 in Seminyak Bali means you never have to get into a car if you don't want to the beach, some of the best known restaurants in Bali, great shops and bars are all within walking distance. Created as a holiday home with all creature comforts and much tasteful attention to detail, you might never even want to venture far beyond it. 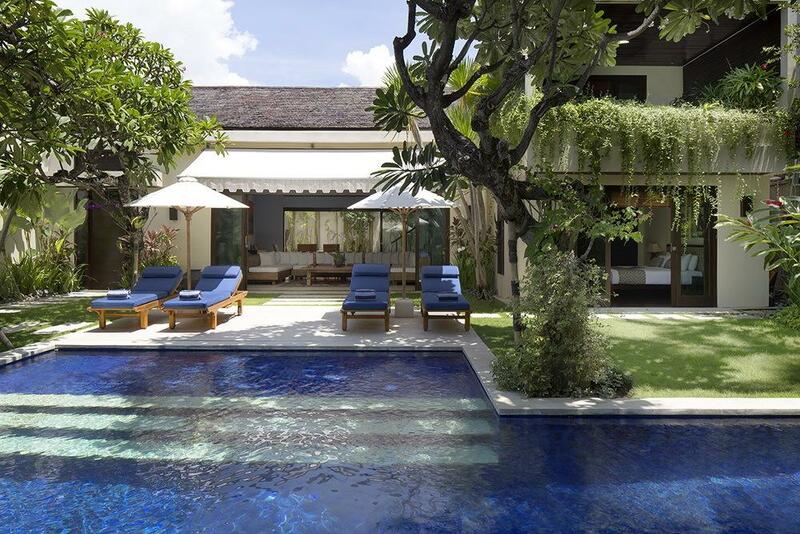 Generously laid out on over 600 sqm and two levels, Villa 3169 has a light, contemporary style rounded off by carefully selected Indonesian antiques and ethnic accent pieces providing local timbre. 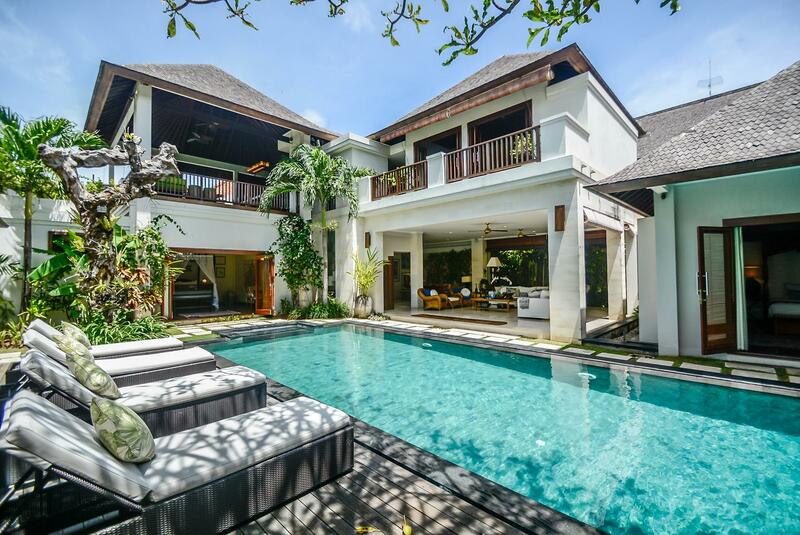 The Villa has generous open living spaces flowing into each other that were designed to catch a breeze and allow you to enjoy the best of tropical living. 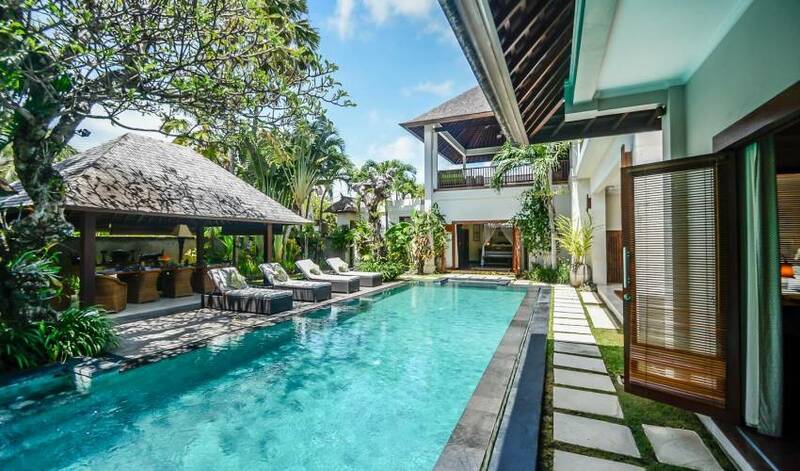 The property features 4 air-conditioned bedrooms with modern en-suite bathrooms, a contemporary fitted kitchen with all appliances, two separate open dining areas, a large comfortable living room, a generous open lounge or bar area and a small office space. A state of the art Bose sound system can be controlled remotely from the living room, the pool and the dining area. Wireless Internet is provided throughout the premises. Special attention was paid to making sure Villa 3169 is child friendly while at the same time allowing parents a maximum of privacy. The comfortable entertainment room that easily converts into a fourth bedroom provides children with their own space to be in while parents can relax in the bar area next door. 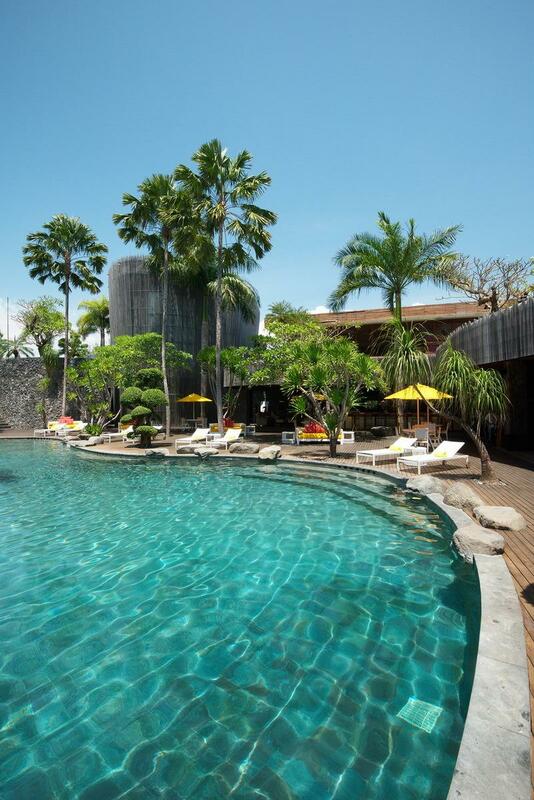 The pool area was designed to have no 'dead corners' and non-slipping finishes such as roughened granite floors and wooden patios around the pool provide additional safety. Resin lamps used throughout much of the house not only provide a lovely warm light, but are safer than traditional glass lamps when it comes to being blown over by the wind or by children. An environmentally friendly solar system provides hot water throughout the property, gray water from the house is recycled for use in the garden, and the pool is based on an ionized system that is not only good to the environment with its reduced need for chlorine but is great for your skin too. Villa 3169 even has its own personally designed spa products, with a fresh and nurturing fragrance combining lemongrass, ginger and cucumber for Villa 3169 handwash and bodywash. Additional products from Bali Soap's Island Floral line a make sure you feel pampered in every way during your stay. A striking eye-catcher in the living room is the living back wall filled with ferns, stag horns and orchids. This is a clever re-interpretation of an old Dutch room design where air slits close to the ceiling facilitate air flow through the room. 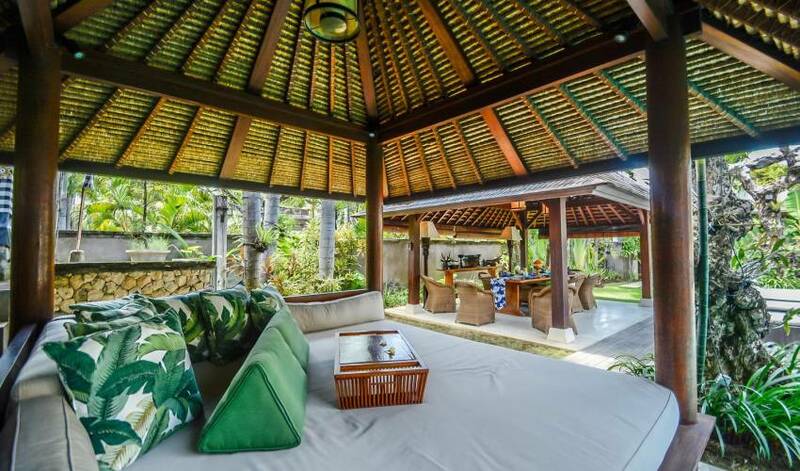 The living wall provides a colourful green backdrop for comfortable oversized white Sunbrella sofas decorated with Ralph Lauren cushions in blue and white, and a beautiful McGuire rattan set. 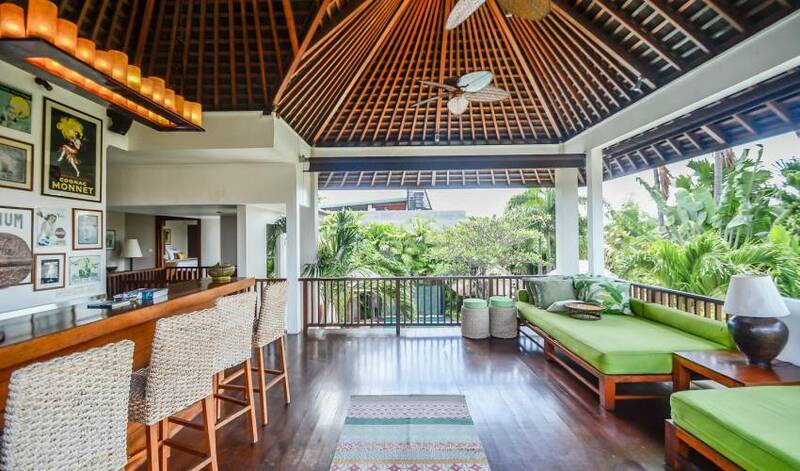 Old Balinese wooden house columns were converted into decorative standing lamps. The living room opens up to the pool and has a view of the dining pavilion on the other side. Villa 3169 has two dining areas. The first is a breakfast area made of large wooden benches and a solid table set between the kitchen and the living room. Colourful cushions and specially commissioned modern art completes this space's fun and casual look. 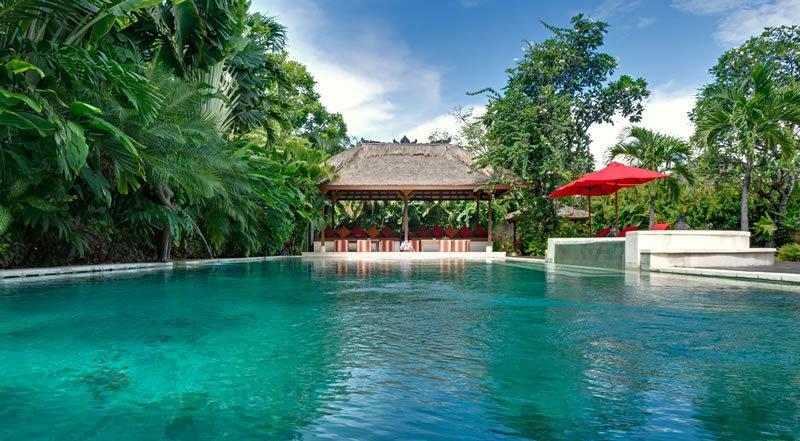 The second dining space is located in a separate Balinese pavilion or Bale across the pool with 10 comfortable rattan chairs and a large wooden table. Trundle beds built into the lounge area allow the room to be converted into a bedroom within moments; thereby making it especially suited for children. This room was conceived to provide children with their own safe, fun space giving their parents a chance to relax on their holiday as well. 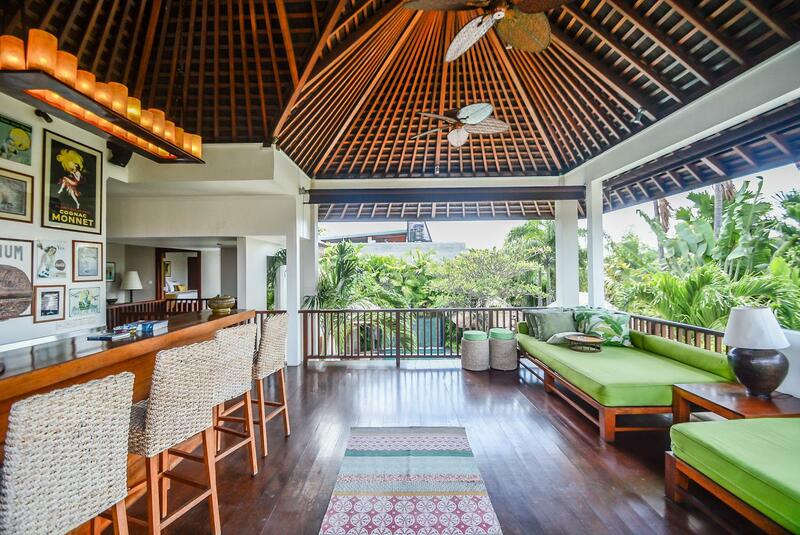 Open on three sides to wonderful views of landscaped gardens and traditional Balinese thatched roofs, the upstairs Bar area almost always catches a breeze from the ocean. Colourful prints of old drink advertisements decorate the back of the bar area, while comfortable sea grass bar stools invite hanging out at the bar. Large day beds covered in bright Sunbrella and Tommy Bahama materials provide additional comfortable spaces to lounge. 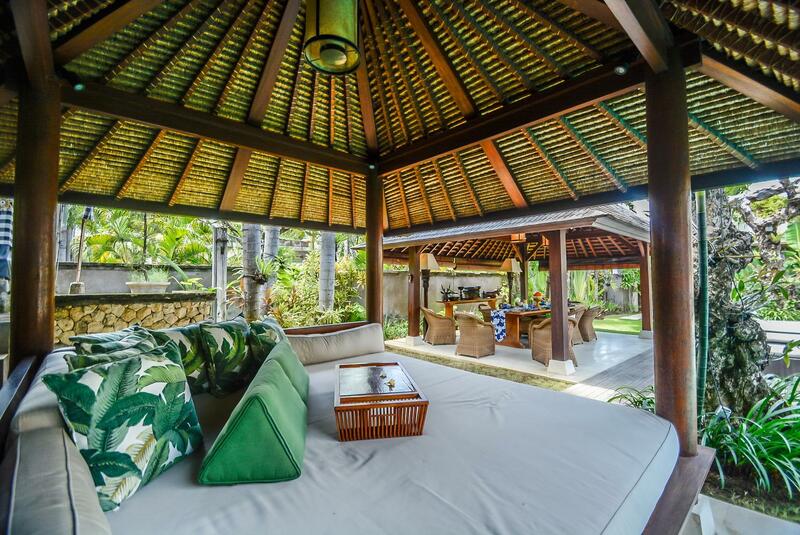 Beautifully hand crafted rattan fans enhance the feeling of tropical living. A specially designed resin chandelier above the bar creates warm, intimate lighting, while a Bose sound system provides high quality musical entertainment. This room is guaranteed to become one of your favourite spaces in Villa 3169. 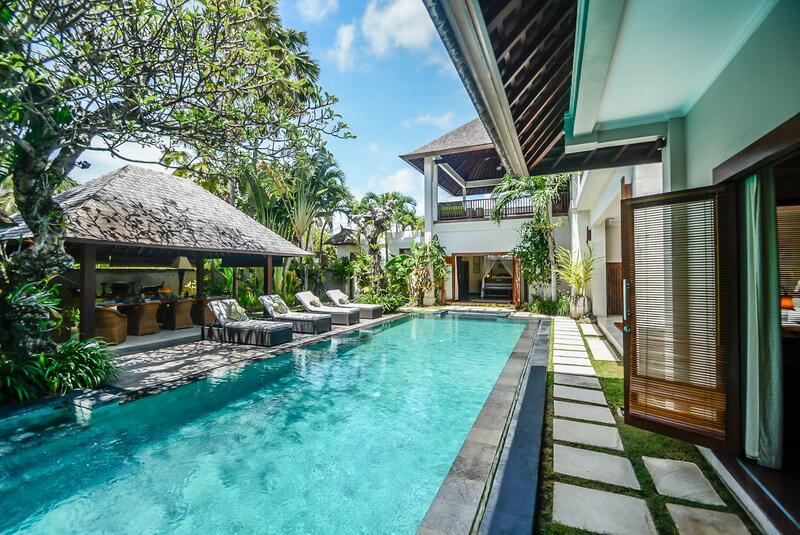 Villa 3169 has 4 air-conditioned bedrooms. The villa was designed so that two couples can comfortably share it at the same time; the two master bedrooms are both on the ground level and are of a similar general setup with generous en-suite bathrooms. Each bedroom features Bose Ipod speakers, a 32-inch flat screen TV, ceiling fans and generous wooden wardrobes or walking wardrobes with safety deposit boxes and plenty of storage space. All bathrooms were designed in a tasteful 'beachy' theme contrasting cream coloured granite with antique woods. Bathrooms all feature two sinks, and the en-suite bathrooms to the 3 main bedrooms have large eggshell bathtubs in addition to open air showers. Antique Jepara wooden carvings from Java were used to create striking mirror frames. The bathroom furniture was made from old recycled teak, thereby not only using beautifully aged hardwood but continuing the environmentally friendly theme of Villa 3169. 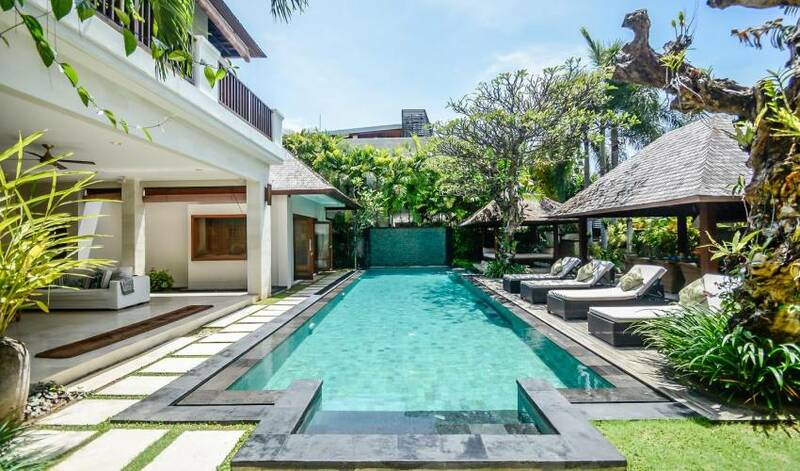 Villa 3169 is centrally located in Seminyak, tucked away in a discreet luxurious complex less than 300 metres from the beach and twenty minutes from the airport. 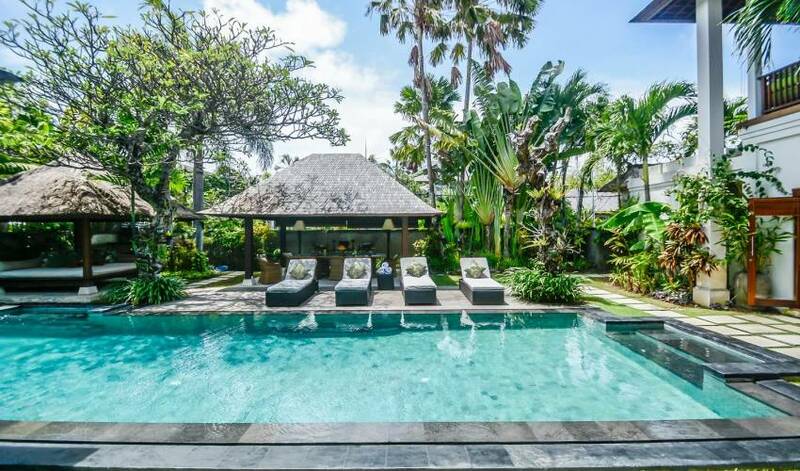 The Villa's location is close to the prestigious Oberoi and Legian Hotels, and convenient for all of Bali's main shops, malls and tourist attractions, in addition to a multitude of lavish spas, chic lounges and vibrant nightspots. 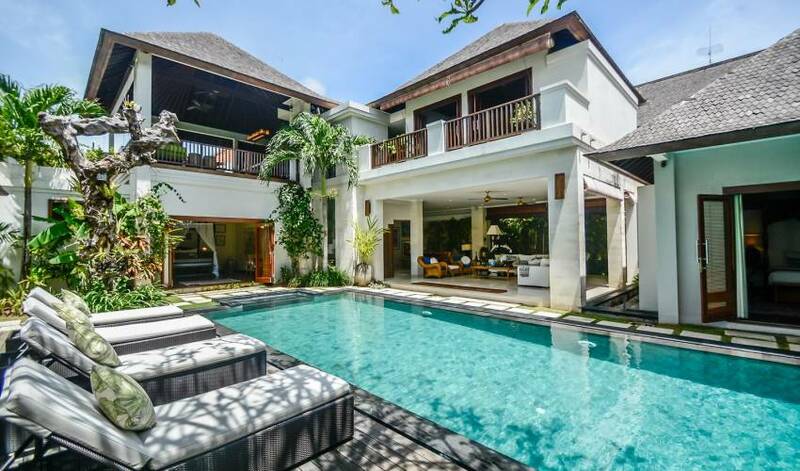 While Seminyak is known for its international restaurants, boutiques and glittering nightlife, Villa 3169's location on a private road with no traffic, surrounded by expansive tropical landscaped gardens, makes it an oasis of calm in the middle of Seminyak's bustle.